Are you where they are? Good point. Might make sense on Twitter too. If you’re a marketer and your hangin with other marketers, then you might not run into many clients or customers or leads. That’s not actually your fault, it’s the nature of the way we follow and are followed. But maybe it might make sense to find people in a certain vertical and follow them? I’ll give you an example. When I was in college, I sold concert t-shirts. It paid well, I loved music, and it was a helluva gig. There were a couple of challenges though. First, they were bootlegs, and second, I wasn’t the only one selling them. So whenever there was a big stadium show for example, every t-shirt seller from here to BFE was out selling them. Too much competition. In fact, there was so much competition that we would all end up clustering by the same places hoping to make a sale and ultimately end up talking to each other and selling/yelling at customers. Oh and third? Some of the shirts were of lesser quality and limited sizes and yet, some of the sellers would sell at a lower price that ultimately disturbed the economic balance of the business. Sound familiar? 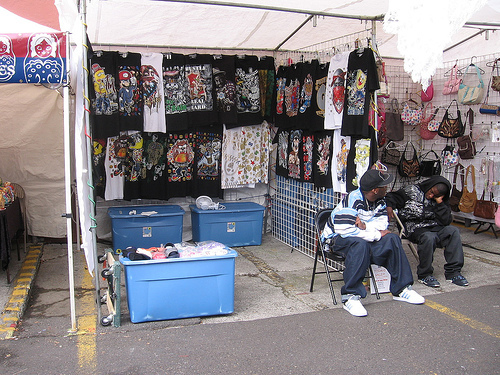 However the shirt sellers that hustled, broke off from the rest, and found quieter pockets of customers that were tailgating for instance, had a much better chance of talking with the customer and also having an exclusive captive audience, thus resulting in not just one sale, but perhaps selling 4-6 shirts at a premium price. I know it’s a stretch for an analogy but the point is that now more than ever, your strategy needs to be more focused, refined, flexible and targeted. Instead of yelling and selling, go find the quiet bunch of tailgaters chillin and grillin and ready to buy. But don’t wait for them.